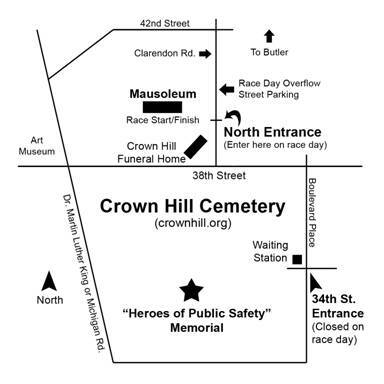 The race day entrance to Crown Hill Cemetery is at 700 W. 38th Street and is located off of 38th Street and Clarendon Road (1st stop light east of Michigan Road/Art Museum, or the 4th stop light west of Meridian Street). Parking is available behind the Mausoleum and in the Funeral Home parking lot on a first-come basis. Additional parking will be available on Clarendon Road north of the cemetery entrance.